Fat Jones Stables, home to both Flicka and Goldie, had been established by Clarence Young “Fat” Jones in the 1930’s. 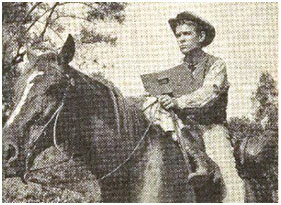 He owned and ran the popular movie horse stables until his death in the early 1960’s. Sold soon after his death, it still continued as a stable until it was torn down in the 1970’s. 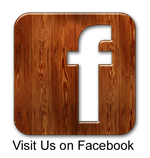 It was located in North Hollywood on Sherman Way, just a short distance east of Lankershim Boulevard. We have not yet found out exactly what happened to Goldie after the series ended, but it stands to reason that he would have continued to be put to work in television. TV westerns were still at the height of their popularity, and there was plenty of work for such a talented and well-trained horse. It definitely is a shame that prominent film horses have not been kept better track of, but there is detective work being done as we speak to try and track down additional work that was done by Goldie. Series fans and horse aficionados have noticed horses in later television series bearing a strong resemblance to Goldie. 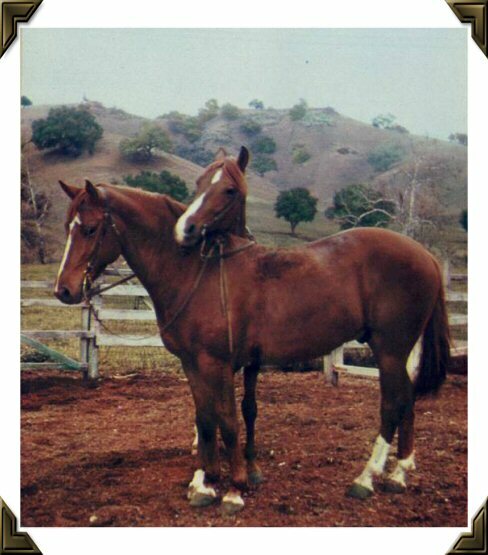 The markings of these other horses vary a bit, but makeup was often used to make stunt horses more closely resemble the horses for whom they doubled. Here are some photos of a horse that some viewers have suggested was our Goldie. 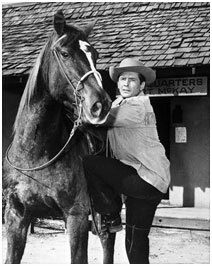 Some have suggested that this horse that was ridden by Jack Kelly in the Maverick TV series that ran from 1957 to 1962 was our Goldie. Kelly played Bart Maverick, starting with the eighth episode of the series. In the storyline, Bart--in desperate need of transportation--purchased the horse (coincidently named Goldie) from a passer-by, in the episode "Betrayal." Just a few episodes later, he gave Goldie to a young admirer in the episode "The Lass With the Poisonous Air." Now, this horse looks like the same one Jack Kelly rode in Maverick. Will Hutchins rode the horse in the beginning of his role as the lead in the TV series Sugarfoot, before switching to a more cooperative horse named Penny. 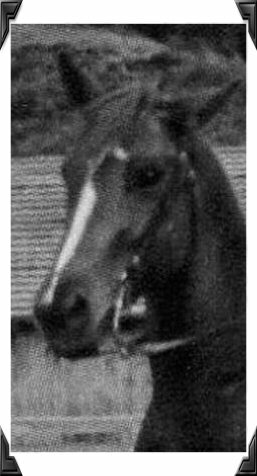 Hutchins said that the horse in these photos was called Sickle, apparently after the shape of its white blaze (looks a bit more like a pipe wrench though). 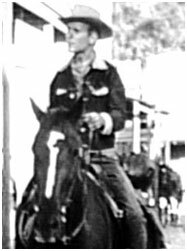 The series Sugarfoot ran from 1957 to 1961, so when Hutchins switched to riding Penny, this horse may have been picked back up from the stables for Jack Kelly to ride in Maverick. 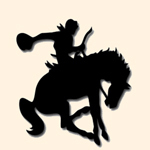 Both the Maverick and Sugarfoot series were produced by Warner Bros. and aired on ABC. Jack Kelly even appeared as Bart Maverick in the Sugarfoot episode "A Price on His Head." So what do you think, pardner? Is this the same horse as "our Goldie" in My Friend Flicka? We'll be sure to share with you any additional information on Goldie's later career as it becomes available to us, so if you have any information on her, please share it with us!